The BMW F 850 GS is the newest middleweight adventure bike in the market. Does it have what it takes to unseat the very popular Triumph Tiger 800? We ride both bikes on the highway, and on some off-road trails to see which one is better overall. 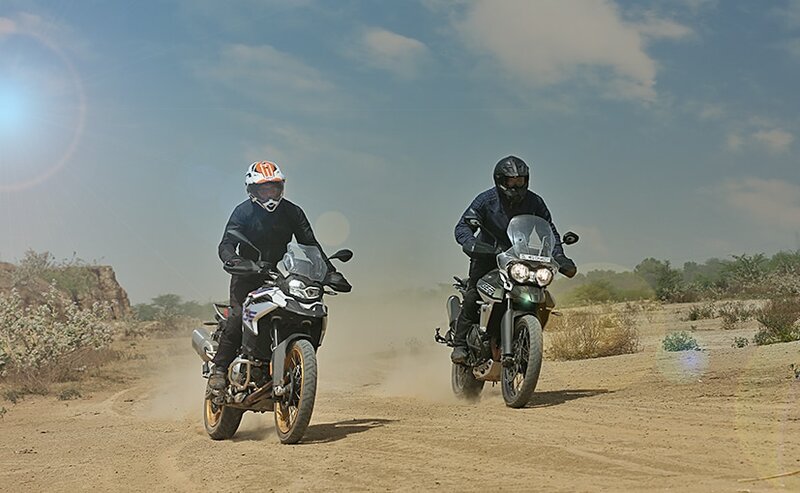 The BMW F 850 GS meets the Triumph Tiger 800 XCx - two middleweight adventure bikes, both promising a level of capability that should meet all your two-wheeled adventure needs. Both are designed to cover long distances on tarmac, and to glide over the rough where the road ends. 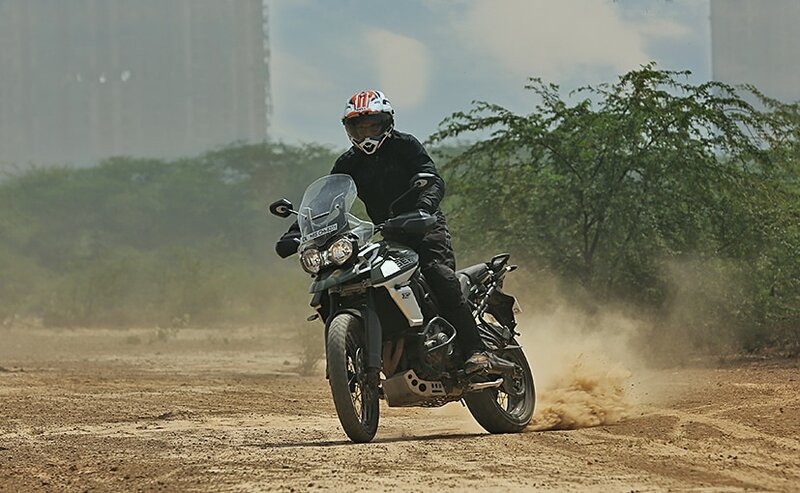 The Triumph Tiger 800 XCx is the popular choice, not just in India, but around the world too; the middleweight British adventure bike has an almost unmatched fan following, and it's an all-round great bike. 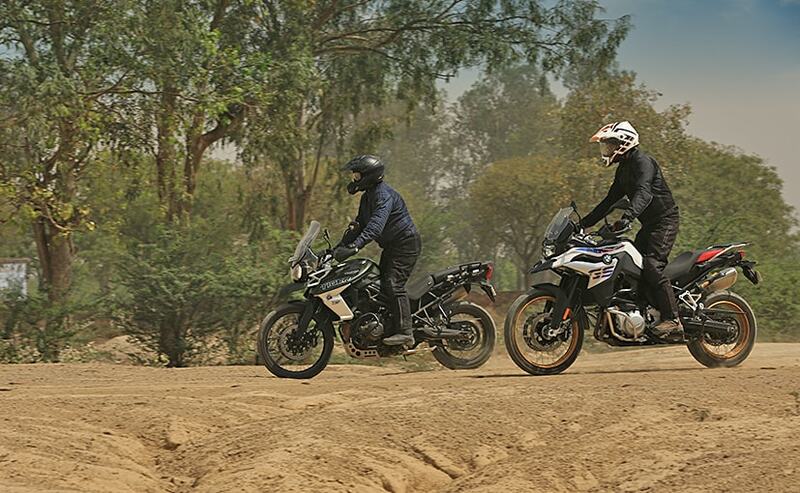 The BMW F 850 GS boasts of German adventure lineage, renowned GS pedigree and top notch build quality and engineering. Even on paper, it seems like a tough choice, choosing one over the other. The question is - which one should you choose? Both bikes seem to murmur promises of taking you beyond the horizon, where all that matters is the will to seek out adventure, and the attitude to explore more when tarmac disappears. They are big, burly and tall, and may look somewhat intimidating at first glance if you're not used to rubbing shoulders with big ADV bikes. But if it's one thing they have in spades, it's presence, not unlike a big, burly SUV, with somewhat similar capabilities. Fit and finish of the GS is top notch, and every small surface, every single component of the bodywork and chassis feels built to last, and speaks highly of quality. The 850 GS, particularly in the BMW Motorsport Rallye colour scheme of our test bike - in white, red and blue, is strikingly attractive, giving it a dash of sportiness. The Rallye colours also come with the gold coloured spoked wheels, adding even more flair and appeal. But keep in mind, opting for the Rallye colours and gold rims comes with an added cost. 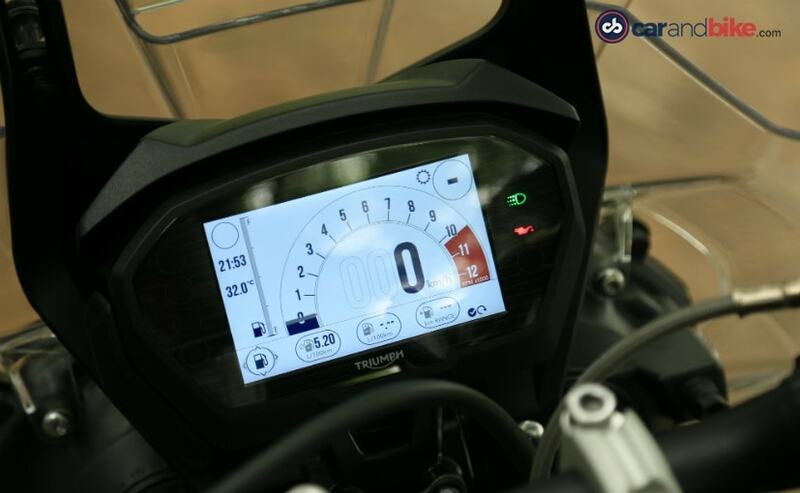 Our test bike also gets the optional TFT instrument panel, which isn't standard. So, you will need to shell out an additional ₹ 60,000 for that full-colour panel. The 850 GS is also available in three packages - Standard, Pro Low Suspension and the Pro, the top-spec package, and the one we're riding. The Pro variant gets LED headlamps, an additional Enduro Pro Riding Mode (along with Road and Rain), and the semi-active electronic rear suspension, which can be adjusted at the flick of a button. The Rallye colour option with the gold rims however, will set you back by an additional ₹ 30,000. While the base F 850 GS variant is available at ₹ 12.95 lakh (ex-showroom), the Pro variant in Rallye colours will cost ₹ 15.3 lakh (ex-showroom). Comparatively, Triumph's off-road focussed middleweight adventure bike has two variants on offer - the Tiger 800 XCx, priced at ₹ 14.03 lakh (ex-showroom), and the top-spec Tiger 800 XCa variant, priced at ₹ 15.16 lakh (ex-showroom). The Triumph's overall silhouette has remained more or less unchanged over the last three generations, with some minor cosmetic updates. Now, it gets bolder graphics, slightly different ergonomics, and some updates to the engine and clutch. The Tiger also gets a standard aluminium sump guard which offers more protection when riding off-road, and the top-spec XCa offers a sixth, fully customisable riding mode (Rider) as well as standard heated grips, seat and auxiliary lights. The Tiger 800 XCx retails at ₹ 14.03 lakh (ex-showroom), while the top-spec XCa variant is priced at ₹ 15.16 lakh (ex-showroom). 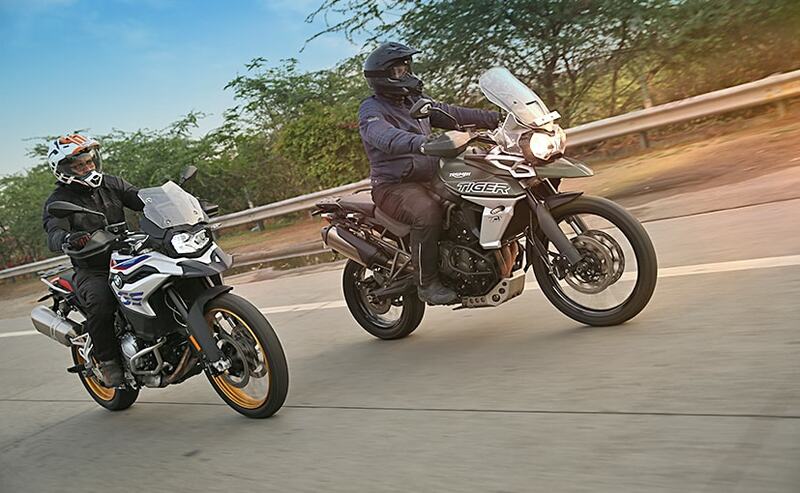 In terms of pricing, both are more or less evenly matched, but variant to variant, it's the Tiger which has more bang for your buck, although the Tiger misses out on tubeless tyres, which the GS gets as standard. In the electronics department too, the Tiger offers more versatility with several riding modes. For off-road newbies, there's the Off-Road mode, which offers limited wheel slip, but the safety of the traction control to rein a slide in when things begin to go out of control. The Off-Road Pro mode offers even more wheel slip for more experienced off-road riders. But every time you switch off the engine, the Tiger's mode selection goes back to default Road mode, which can be a bit of a minor irritant, because again you have to choose your preferred riding mode. 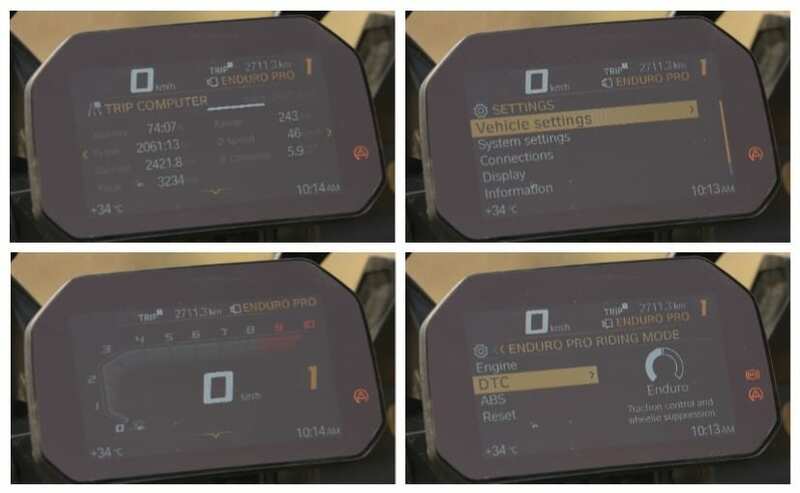 On the standard F 850 GS, you only have Road and Rain, but in the Pro variant, you do get the Enduro Pro Mode which offers full customisation across throttle map, ABS and traction control settings, and your chosen settings will remain even when you need to switch off the bike. The top-spec Tiger 800 XCa also gets a fully customisable Rider mode which allows full customisation across all parameters - throttle map, ABS, and traction control. On specifications too, both bikes are more or less evenly matched. The India-spec BMW F 850 GS is slightly detuned to run on lower octane fuel. After all, how many fuel stations with high-octane fuel do you encounter once you're out of city limits? The F 850 GS is powered by a 853 cc, parallel-twin engine which puts out 90 bhp at 8,000 rpm and maximum torque of 86 Nm peaking at 6,250 rpm.. It may be manufactured by Longshing in China, but it's of high quality, and has the refinement and performance to make it immediately likeable. At the press of the starter, the parallel-twin comes to life with a very likeable 270-degree firing order rumble. And if you're over eager with the right wrist, the punchy motor can make the front wheel rear skywards very easily even in second gear. The mid-range is where the BMW feels most eager, and within the city, it's a hoot to ride. The Tiger's 800 cc, in-line three-cylinder engine is smooth, refined and puts out 94 bhp of maximum power at 9,500 rpm, with 79 Nm of torque peaking at 8,050 rpm. 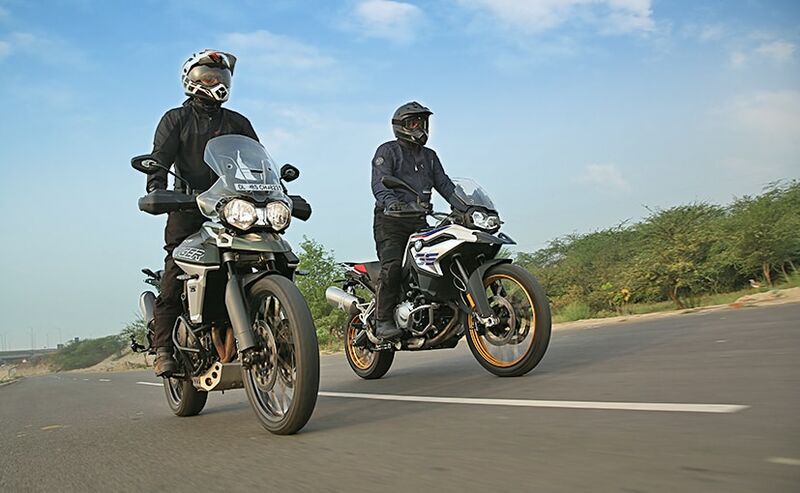 What those numbers mean is that the Tiger has a high-revving engine, likes to be ridden hard, and has a superb soundtrack reminiscent of its supersport lineage. Yes, it's an adventure bike, but there's no mistaking the Tiger's sporty DNA. Ride quality is plush and comfortable, and you sit upright, with the tall windscreen keeping away any unwelcome wind blast when you're in the mood to cover several hundred kilometres over a day's ride. The torque peaking at high revs also means the Tiger's always rearing to go, even at highway cruising speeds; so, there's no need to downshift when just a twist of the wrist can get you ahead of any distracted driver at the wheel of a four-wheeler obstructing your path. Any true-blue adventure bike needs to have respectable off-road ability. And this is where both the Tiger 800 XCx and the F 850 GS boast of real off-road capability. Both bikes come with spoked wheels, with a 21-inch front and 17-inch rear combination. But the BMW has a definite advantage here, since it comes with standard tubeless tyres. The Triumph gets tubed tyres, so in the event of getting a flat tyre while on a two-wheeled adventure, you can very easily repair a puncture on the F 850 GS with a tubeless puncture repair kit, but the Tiger? Well, you will, in all likelihood, need to take the wheel off, wrestle the tyre off the rim, patch the tube, or even replace it, and then put the wheel back. Needless to say, it's not only a considerable effort, but you will need the basic skills and practice to do this. Then there's the suspension travel; the Tiger comes with 43 mm WP upside down forks, with adjustable rebound and compression damping and offers 220 mm of travel. The BMW also has upside down 43 mm front fork, but it's non-adjustable and has less suspension travel (204 mm). The difference won't matter much to you if you're new to off-road riding, but if you have some experience riding off-road, and when you're going over the rough, and even loose sandy or gravel trails, it's the Tiger which offers a tauter front end and inspires more confidence. 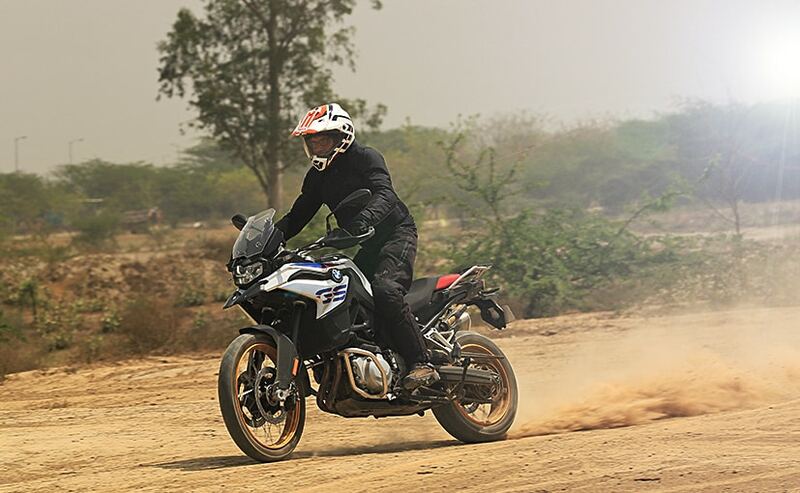 The faster you go, the Tiger feels more planted and stable than the F 850 GS. 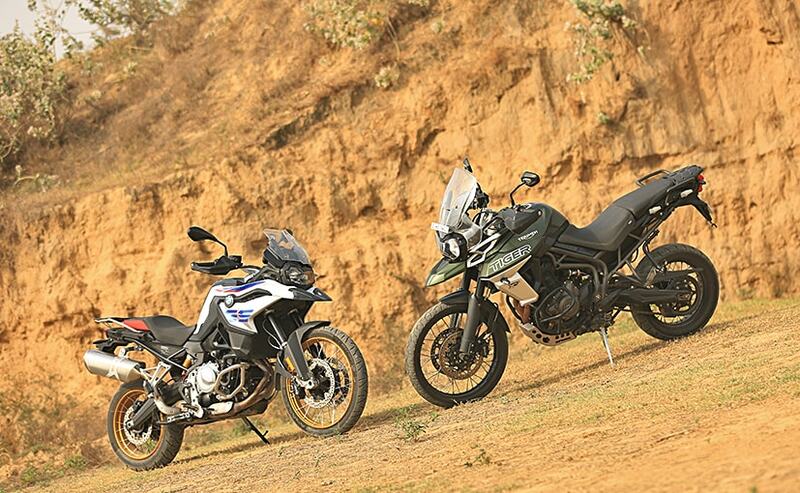 The GS though has a slight advantage over the Tiger while going off-road. The strong low- and mid-range makes tackling off-road obstacles a little easier, with more pulling power at low revs. This is a close one! The BMW F 850 GS looks good, rides well, and is quite capable off-road. But for your adventure needs you will need to add some aftermarket extras, like a taller windscreen and a more robust engine bash plate, which will add to the overall cost. Both bikes get standard factory-fitted plastic handguards, which offer some protection but aren't strong enough to protect your brake and clutch levers, in case of a fall. Here, you will need to upgrade to more robust off-road capable aftermarket handguards on either bike. 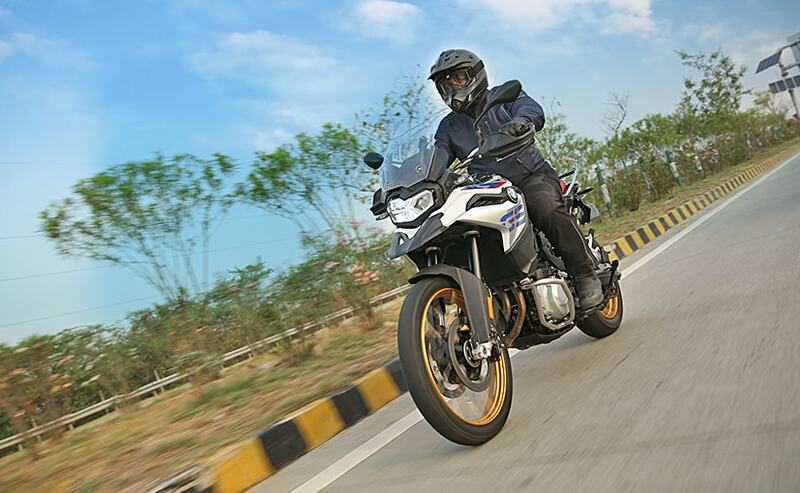 The Tiger though gets a tall and effective windscreen as standard, and also gets a factory-fitted aluminium bash plate to protect the engine's underbelly. Then, there's the question of range and fuel consumption. Both bikes were ridden spiritedly, within the city, on the highway, and with a fair bit of off-road duty thrown in. 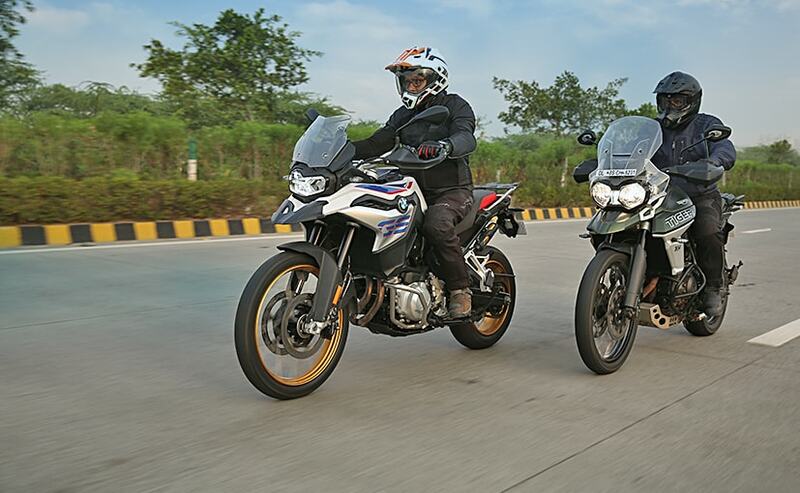 The BMW F 850 GS returned fuel economy figures of around 17 kmpl, while the Tiger 800 XCx returned over 19 kmpl. The difference isn't much, but primarily for touring, it's the Tiger which will have marginally more range with a similar 19-litre fuel tank both bikes come with. 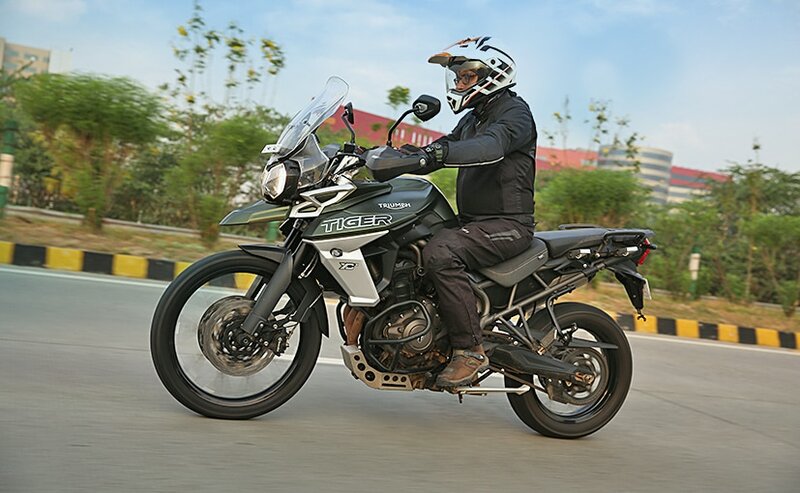 But riding within the city, the Tiger's triple cylinder engine tends to run hot, and could be a little bothersome if you're stuck in bumper to bumper traffic. Comparatively, the BMW's parallel-twin engine runs cooler and has no uncomfortable heating issues, even in traffic. Finally, it depends on what you're expecting from your ride. If you're looking for exclusivity, then it's the BMW F 850 GS which should be the natural choice. It does everything as good as the Triumph Tiger 800 XCx, but eventually it's also down to a few personal choices and preferences. There's also the question of living with the bike, and maintenance costs. During our test ride, one of the BMW's turn indicators fell off (possibly was cracked from earlier, and fell off while riding off-road). A replacement for the turn indicator will set you back by ₹ 6,000. The same indicator on the Triumph Tiger 800 XCx will cost ₹ 3,600. Over a 3-4 year ownership period, it will be the Tiger which will be the easier and more affordable bike to maintain and service. But more than just cost of ownership, what's also important is what you intend to do with the bike, and what you expect from it. 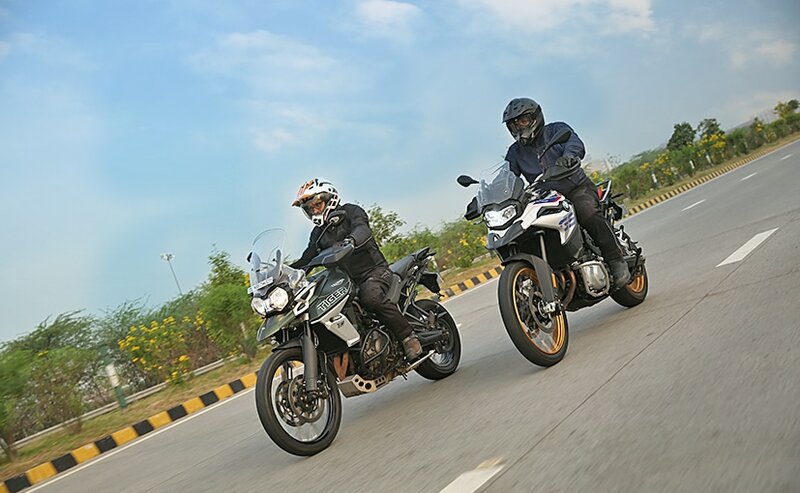 If you intend to have just one motorcycle, which will do everything - commute, tour, off-road and occasionally give you the thrills of a sportbike in acceleration, it's the Tiger which offers that kind of versatility, and it remains our choice in the middleweight adventure category, as a very capable all-rounder.